Growing grains is one of the most rewarding experiences. I’m not sure if it’s their ancient significance, the sheer height of the plants, or the satisfaction of bundling, drying, and threshing the harvest. It’s certainly not an experience that you can accomplish overnight. We use whatever variety of winter wheat is locally available and plant in the fall. The seeds can be broadcast sewn over a field and then covered with some mulch to deter the birds. In the spring, it will look like some bright green grass (wheatgrass) has shot up in the field. Very soon, your wheat will begin to get tall and develop the characteristic seed heads. As summer progresses, it will dry into a beautiful golden color and stop growing. 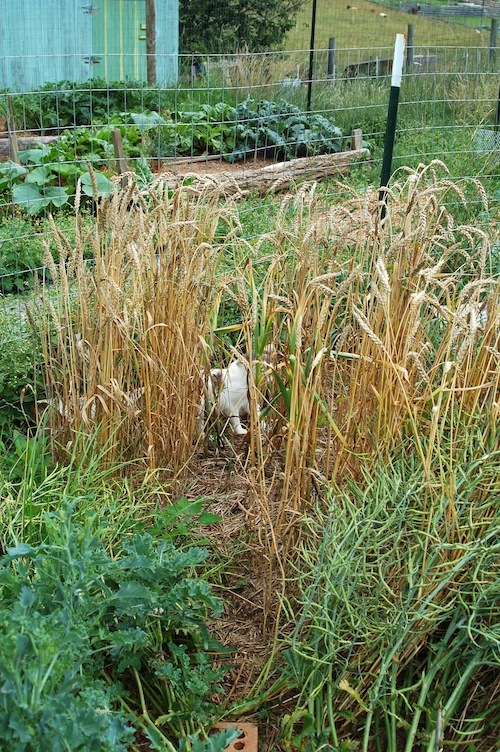 The seed heads are naturally dried a little bit on the stalks at this point. You know your wheat is ready to harvest when the seed heads begin to angle themselves more dramatically, bending in swooping arcs that will eventually angle towards the ground. Now is the time to harvest, before the wheat falls out of the husk. 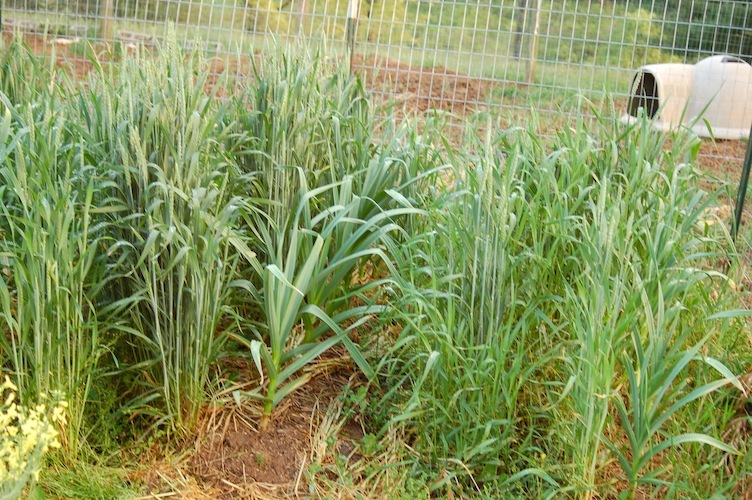 I used a pair of small, sharp hand shears to cut the wheat at the base while holding the middle of the stalk. Then I loaded it into the wheel barrow, making sure all the grain heads were the same direction. 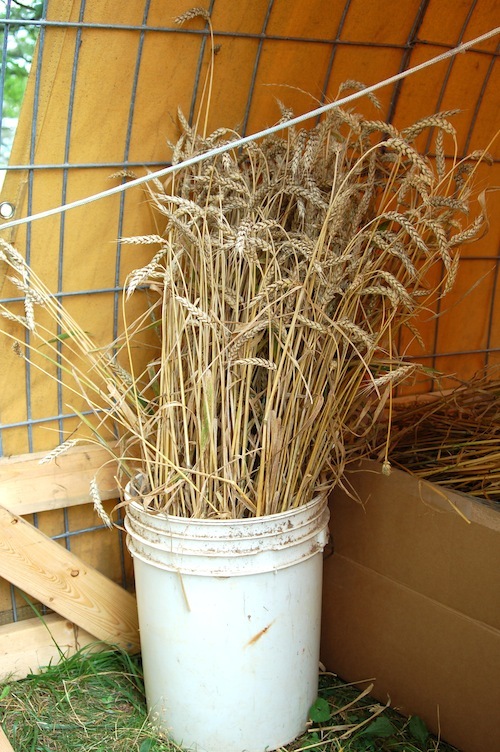 When I ran out of space in the wheel barrow, I used buckets to hold the wheat. Then I sat for a long and tied the wheat into bundles called sheaves. 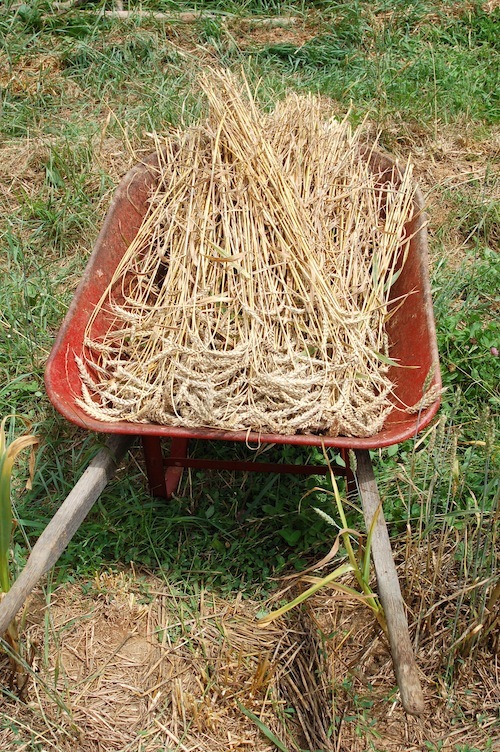 This uses twine to bind the stalks together. 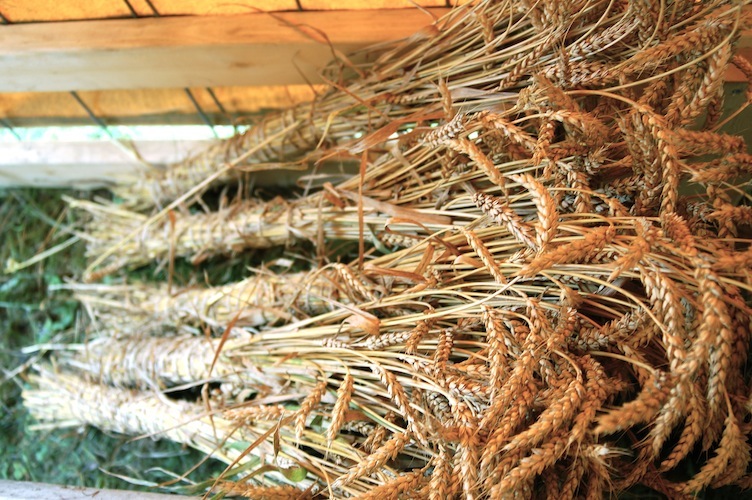 Then the sheaves are all leaned together to form a shock that further allows the wheat to dry. I snacked on the wheat berries all the while, of course. More updates to come once the seed heads finish drying! Growing grains is really hard work. Thanks for the writing!